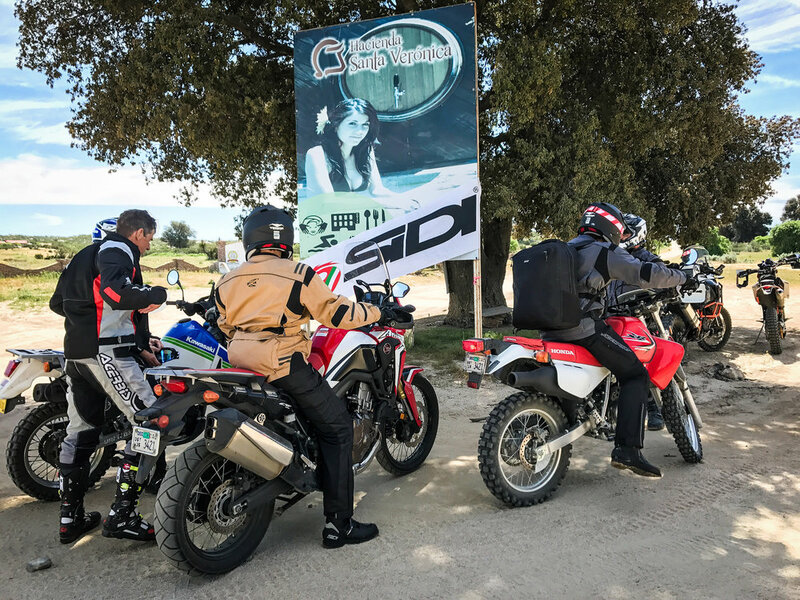 Upshift’s Simon Cudby recently rode to Baja Mexico for the 1 event to launch their full line of products including: Sidi Boots, Vemar Helmets, Forcefield Body Armour and AGV Sport Adventure Gear. Simon sat down with Motonation founder Bill Berroth to talk shop and Ride Baja. Upshift: Alright Bill, well first of all, thanks for having us down on this great ride in Baja. Tell us about your history of riding down here. Bill Berroth: Well, I came out to California in more or less ‘84 and very quickly discovered Baja was an adventure: the openness of the people, the openness of the terrain, the wilderness of the countryside. I’ve never been a track guy so being in an area like this where things are more free than California, even in the ‘80s it was pretty locked down. It was really attractive and I just loved the terrain, the lifestyle, the people, and everything about it so I’ve been coming for years now. Upshift: So we heard a rumor that you’ve done some racing though in the past. Then the next year the Six-Days was in Massachusetts and I’m from Connecticut, so it was just up the road. We saw the Husky truck and the Penton truck driving up through our town. We talked to a friend of mine’s dad, and he said, “Yeah. I heard there’s this big race up there.” We really didn’t know what it was, but we piled in the station wagon and we drove up and saw the final moto grass track and all these Europeans and everybody running around. Then I put two-and-two together with the movie, and said, “Yeah. I need to do that!” At that point, I got off of a mini bike and onto a real motorcycle. I started doing some Motocross and some Enduros and went to the Six Day qualifiers that they had for the Americans to be on the team. I went to the Six Days twice, which was my goal to do at the time. I raced around New England quite a bit in the Enduro Series there. It was a pretty prominent championship at that time. What I really wanted to do was go to Six Days, so I did that a couple of times and got a couple of silvers, and did it when it was the ISDT. After they put the E on the end of it, it got really easy. So I did that and some other stuff. Upshift: So we’re down here in Baja, and we’re trying out some of your new products. Tell us a little bit about Motonation and the brands that you have in your catalog. Bill Berroth: Well, my partners Don Emler from FMF fame, Danny LaPorte (everybody knows what he’s accomplished), Alan Cunningham our friend from Australia and I founded Motonation in 1999. The first effort was to be a new representative for Sidi boots in the USA. At the time, Sidi was not well-known at all, although it was one of the first purpose-built motocross or off-road boots ever made. It wasn’t represented well in the USA for a long time. I was able to convince Sidi that they needed to do something different and give us a shot with a brand-new company with passion and enthusiasm. Here we are 18 years later and we’re the number one boot distributor in the world for Sidi now, and the number one cycling shoe distributor as well. Upshift: Tell us how you’re connected with AGVSPORT, FORCEFIELD, and VEMAR HELMETS. Bill Berroth: Along the way, people saw that we were doing a good job with Sidi. And our philosophy at the company-- we’re basically a distribution company, like PARTS UNLIMITED is a very well-known, big distribution company. They and some of the others of their size have very big catalogs. They’ll take on any brand. It’s just a huge collection. Our angle is different. We don’t want a lot of products. We wanted very few products and we want to focus on them like partners, marketing and promotional and sales partners with the brand. So over the years, these other brands have come to us. Other than Sidi who I went to convince, the other people have come to us and made proposals to us seeing what we’ve done. We’ve been with Vemar for about 10 years and with Forcefield and AGV Sport for probably six or seven years. With all those things, we’ve kind of ended up being a distributor of items for the rider; from boots to helmet, jackets and pants and protective armor and things like that. We just sort of ended up there; it wasn’t a master plan at all. Upshift: You’re not just a distributor, though, right? When we talked yesterday you were saying about how much input you put into the development of new products and that kind of thing. Bill Berroth: Yes, we are more than just a distributor. We want to be a partner with our guys and help them in any way we can, so we do a lot of product development. A lot of guys in our office ride bicycles and motorcycles both. We’ve generally been at it a long time and have done some things in our lives, so we have a pretty decent idea of what can work and what doesn’t. Over the years, we’ve developed a philosophy: We will not sell anything that we have not personally tested first. If we’re happy with it and we think it has a place, we will offer it. That has expanded along the way with Sidi, who is primarily a cycling company first, in a lot of things that it does. With the motorcycle stuff, we talk to them more about that product and get involved in some of the development or suggestions as needed. With cycling, they’re very, very knowledgeable, so we don’t really get involved as much in that arena. We had some input with the development with Vemar helmets, including some of the details the American market wants, what they should watch out for and mistakes to avoid. So we’re pretty involved with the development in addition to the distribution. As far as the AGV Sport jackets that we’ve tried on this trip, the quality seems really good. Upshift: Tell us a little bit about where that jacket and pant combo fits into the marketplace. Bill Berroth: Well, those are either adventure, touring or street riding depending on how the rider wants to use it. We have two or three different pants. The ones you’re using are my favorite, the Telluride. They have big zip-open vents for the warmer days, but you can zip them closed and put a waterproof membrane inner pant in and you’re dry and warm. All of this stuff is really versatile. It’s functional. Like we say, we try all this stuff and drive the manufacturers crazy with little detail changes along the way. We try to do the AGV Sports stuff at a reasonable price. There are plenty of guys that put together a jacket or pant that’s as much as a mortgage payment. They’re fantastic and everything, but I really don’t think anybody that doesn’t work on Wall Street can afford to buy one of those. We try to do as well as we can to have our products reasonably priced without taking it too far and being cheap. We could make a jacket that looks like what you’re wearing today for half as much money, but it won’t do what it needs to do. We want it to function and have it come out as reasonably priced as possible. If it starts to get up and to the moon, that’s just not what we believe we should be offering. Upshift: Apart from riding in Baja, which you’ve done a lot of, what’s your favorite place to ride a big adventure bike? Bill Berroth: A big adventure bike? I’ve been lucky. I’ve been able to ride a big adventure bike in Australia, Europe and here. When I was racing all the time, I’d go back and forth across the country just to go to one race after another. I never stopped anywhere, did anything, or got out to see the little towns. With the adventure bike, I can go back to some of these areas that I just saw off of the freeway, and actually stop and explore. So I don’t really have a favorite area. More than anything else, I like to hit places I haven’t experienced. I always find good stuff wherever I go. I don’t have one favorite thing, I just want to travel and experience new things.